Starring: Del Zamora and Quincy Adams Jr.
Virgil (Adams Jr.) is a boxer who is nearing the end of his career. He’s mainly a trainer now, working at the boxing gym. He’s going through a wistful period in his life, and these nostalgic days are rudely interrupted when the local street gangs assault his daughter. Blake (Zamora) is a repo man who has at least one relative in one of the gangs, and knows the gang scene fairly well. Blake has a good job and a loving wife, and wants to eradicate the gang problem currently plaguing their California town. When the unlikely pair of Virgil and Blake team up to tackle the thuggery, the concrete will become HEAT STREET! Not to be confused with Beat Street (1984), Heat Street is another City Lights production (for those who don’t know, it was the pre-PM company of Pepin and Merhi). Like other City Lights movies, here the P and the M were still finding their way in the world of action. It’s interesting to see the formative stages of what would become the leader in DTV action movies. So they were finding their way in the world, and what others may see as amateurish, we see as the beginnings of the PM empire. Also their obsession with repo men continues (or, rather, starts, as Chance and Repo Jake came later). Pepin and Merhi were ahead of their time - now there are about 12 reality shows about repo people. The movie opens with what you might call “profiles in weirdness”, as the bizarrely hairstyled and dressed gang members pose for glamour shots. That’s how you know these people are in gangs. Because they dress like rejects from The Warriors (1979). One of their modes of attack is “Bikefighting”, something later expounded upon and improved in later PM’s. Our TRUE sixth President, Quincy Adams Jr., plays the Black boxer with a lot of pride. Most of his lines are spoken with a nearly-impossible-to-hear mumble that really won our respect. I mean, if you’re an actor who has only been in a scant few projects, and you don’t make the slightest effort so the audience can hear your voice, you must be a confirmed badass who honestly doesn’t care what you think about him. Our hat goes off to you, Quincy Adams Jr. You really should have been in more stuff. His counterpoint, Del Zamora, has been in countless projects and really made a nice career for himself. But here he just barely holds his own with QAJr. But it’s not Zamora’s fault, he does his best, it’s just that QAJr. is a force to be reckoned with. There’s the time-honored poolhall brawl, and the not-so-time-honored “scene where four people around a dinner table ALL take turns reading their fortune cookies”. Well, you can’t have a boxing movie, or a boxing match, without some padding. There are elements in Heat Street of both The Hitter (1979) and Cold Justice (1989), and as a film, it falls, quality wise, somewhere in between the two. 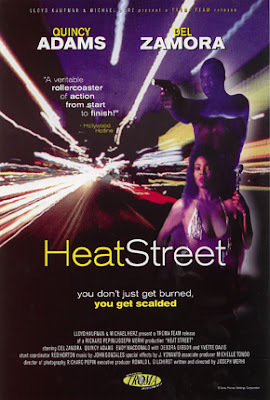 If you’re already familiar with that City Lights style, do check out Heat Street if you can find it. If not...well, check it out anyway as an example of the vibrant days of the video store, when shelves were chock full of material just waiting to be put in your VCR to be taken a chance on. Another City Lights classic! BTW, have you seen Death By Dialogue, The Newlydeads, The Glass Jungle, or either of the L.A. Crackdown films? Haven't seen any of those except L.A. Crackdown II...which will be posted July 5th. Would like to watch those one of these days. Based on your review, I just ordered this movie. The early Merhi stuff is flawed but interesting. I think you would like The Glass Jungle. That's great! Hope you enjoy it. Would like to see The Glass Jungle one day.